Villa Casentino is the perfect accommodation for your holiday in total relax. It consists of 3 bedrooms and 2 bathrooms for a total of 8 sleeping places, very suitable for families with children or small groups. The pool (6m x 12m) and the surrounding park (3000 m2) are for the guests’ excusive use. The interiors (160 m2) have been restored with the attention to the smallest detail and decorated with high quality furniture to grant the maximum comfort. The kitchen is well equipped and the bathrooms are modern and functional. The property is completely fenced with access from the automatic gate. The garden is equipped with barbecue and wood-burning oven to cook first-rate dishes to eat together with your friends, drinking a glass of fine Chianti in the shade of the gazebo. 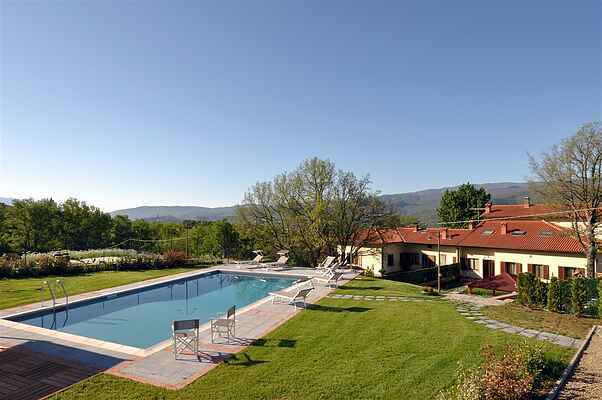 Villa Casentino is the ideal starting point to visit Tuscany, but at the same time it offers all the comforts for a relaxing holiday, full of fun. The house is placed in the first valley run by the River Arno in the Casentino, a hidden corner of Tuscany still unknown to mass tourism. In an hour's drive or so you can reach the most interesting places of Tuscany and the cities of art like Florence, Arezzo, Siena and Pisa. The Casentino Valley is a place rich in history where you can discover medieval villages and castles, Romanesque parish churches and places of worship known all around the world. Once also the supreme poet Dante Alighieri stayed here. Around the area you can also find signs of the Etruscans and Romans who inhabited this land in ancient times. For those who love nature and walking there is the National Park of the Forests of the Casentino, with paths through the forest where you can discover the typical fauna and flora of this area. The castle of Poppi and its village, The castle and the Romanesque Parish Church of Romena, Tanucci square of Stia, the sanctuary of La Verna, the monastery of Camaldoli, Bibbiena with its historical centre. In the summer time all the villages of the Casentino are animated by festivals, fairs and musical events. Sport-loving people cannot miss a lovely walk through the forests and paths of the National Park of the Forests of the Casentino. In Poppi there is also a zoo with the European fauna. To spend a different day, near the village of Papiano di Stia you can fish for river trouts and challenge your friends.